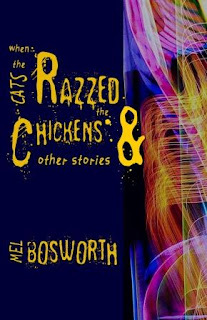 My chapbook When the Cats Razzed the Chickens & Other Stories (Folded Word Press, 2009) is now officially released. The hand-crafted, ridiculously awesome print edition is available for order HERE. Got a Kindle? Order your Kindle version HERE. Want something for your computer? Mobile device? That's covered too, right HERE. Big thanks and hugs to everyone who pre-ordered & helped support the cause. You cats are awesome beyond belief. I can't wait for some Razz to land in your hands. ISBN #'s. Imma try and get it at the bookstore. We'll see. CHRISTMAS IS COMING EARLY! RAZZ-STYLE! My word verification was "woresse"
I can't wait to get this in my mailbox. Soon, my brother. Soon. It's pretty. Soon isn't good enough Mel. Need, now, need RAZZ!